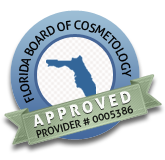 Meet your Florida barber license HIV/AIDS training requirement! All Barbers, Restricted Barbers and Barber's Assistants in the state of Florida must complete 2 hours of HIV/AIDS credits before becoming licensed, in addition they must complete 2-hours before the expiration of every renewal cycle. Our courses will meet either your initial training requirement, or your license renewal requirement! These courses are approved by the Florida Barbers Board to satisfy your Barber's license HIV/AIDS training requirements and 2-year continuing education requirement!